Barcelona, Spain – July 8, 2016 — Air Ambulance Jet has announced the deployment of CLIPPERHUB, a new and fully integrated emergency dispatch system that manages the complex 24×7 process of patient air transportation. CLIPPERHUB is developed in Genero Enterprise by Four Js’ partner Efficiens Way. This implementation of CLIPPERHUB has enabled us to close the loop between pre and post-flight processes at a level of integration we frankly didn’t think possible. The result is simply fantastic. It exceeds our best expectations. 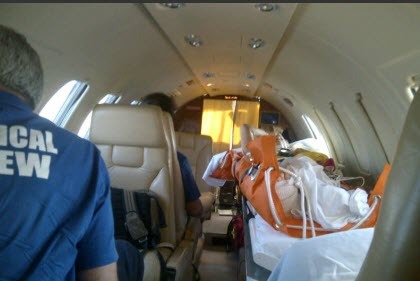 Air Ambulance Jet is specialized in the recovery of patients whatever their medical condition, wherever they are and at whatever the time of day. Their team of highly skilled professionals are ‘always on duty’, ready for any mission at the drop of a hat. The challenge of such a service is to dovetail other specialized disciplines within minutes of receiving that desperate call for help. If an injury prohibits the movement of the patient, the ambulance service must collect the person in-situ, perhaps by taxi or helicopter and take them to the nearest airport. Medical assistance may need to be administered in-flight by a team that itself needs collecting by taxi from disperse sites. CLIPPERHUB’S level of process integration is such, that flight plans are created and embedded into the process within the application. CLIPPERHUB also provides a full accounting package covering: budgeting, cost accounting, reports for airport authorities, crew notifications and agendas, along with billing, purchasing and quality control. Notifications are sent automatically to the flight crew and any necessary documentation is forwarded to all concerned parties, in the event the crew is unable to. Such documents include: airport logistics and refuelling notices, catering, and other special authorizations.